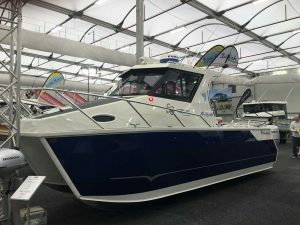 New 2019 Model Sailfish Catamarans S8 for sale featuring the HYDROFLOW GEN 3 HULL. 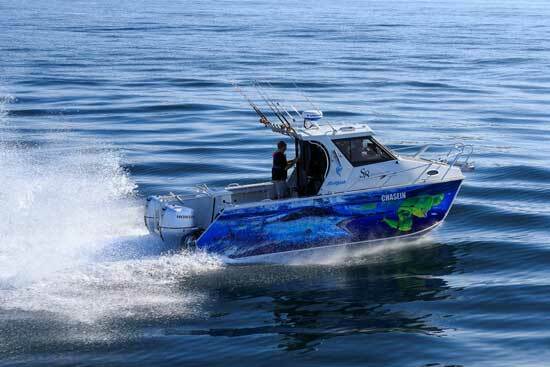 2016 Australias Greatest Boat Winner and the arguably the best trailerable fishing boats of all time. 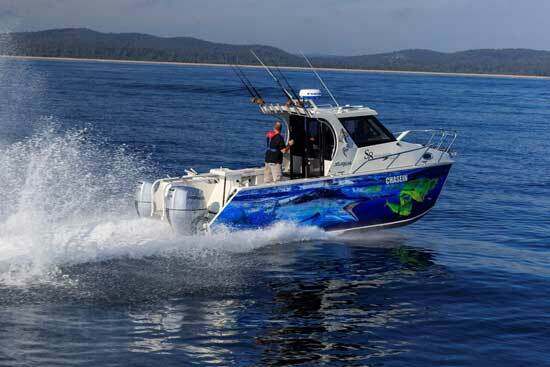 For 2019 the S8 features our all new Hydroflow GEN 3 hull, which extends the waterline hull length by 150mm from our GEN 2 hull allowing increased stability in the stern and faster hole shot performance, plus you now also get more boat for your money. Additionally we have a redesigned chine section allowing increased hull lift allowing improved fuel economy and performance, along with wider running planks on the sponsons which gives the ability to run at lower RPM and increased planning time. 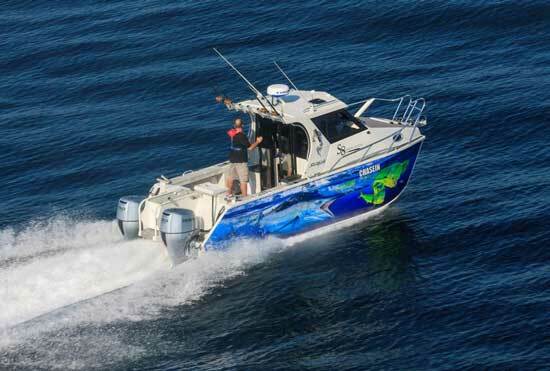 All up the Hydroflow GEN 3 hull is the most advanced hull we have ever built. 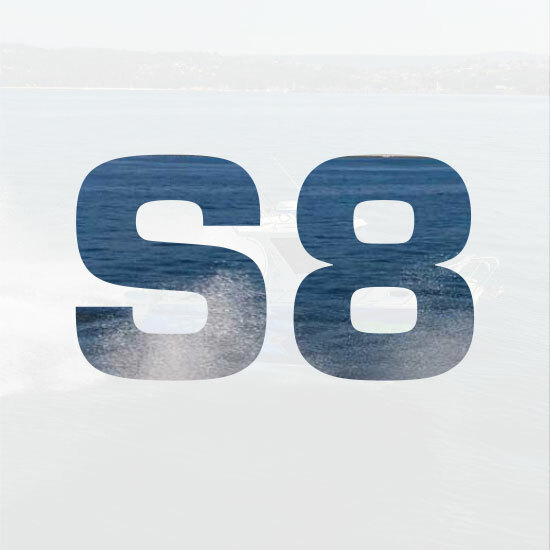 For those who want it all (and then a bit more), the Sailfish S8 is already setting sales records unseen in Sailfish’s history. 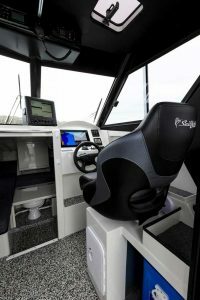 Based on the award winning layout of the S7 with an additional 600mm of overall length, you can choose the extra length for your cabin or rear cockpit, it’s your choice! “I truly believe that the key to our success over the years has been our willingness to listen to what customers want and deliver it in a quality product.” says Sailfish’s founder Darren Foster. A simple mantra on paper but a challenging philosophy to embrace every day. 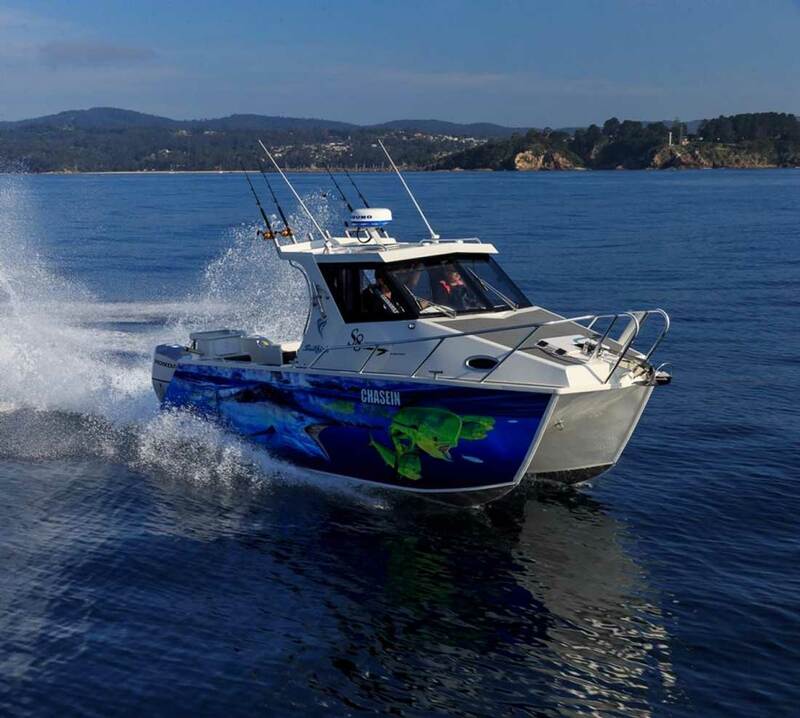 Whilst it was the willingness to listen to customers’ needs and dreams to develop the S7, it was the drive and commitment to excellence that saw the development of the Sailfish S8. “People fell in love with the S7 almost instantly” says Ashley Faraj of Webbe Marine, “but some people just wanted more of a good thing. The extended cockpit on the S8 is a fantastic size and gives the room to fish another 2 people. 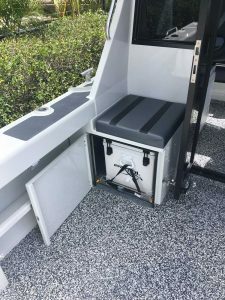 The extra cab alternative allows for a huge enclosed cabin area virtually unseen in a trailer boat”. Atop this is fitted an enclosed glass hardtop with lockable rear door to form a brilliant wheelhouse arrangement that gives the driver a feeling of confidence and comfort in the most demanding conditions. One of the most popular items on the boat is the 2 generous bunks in the forward cabin with a huge amount of storage under. ‘Traditionally we set up the forward berth running port-starboard which is great for couples but is not as practical for fishing mates. 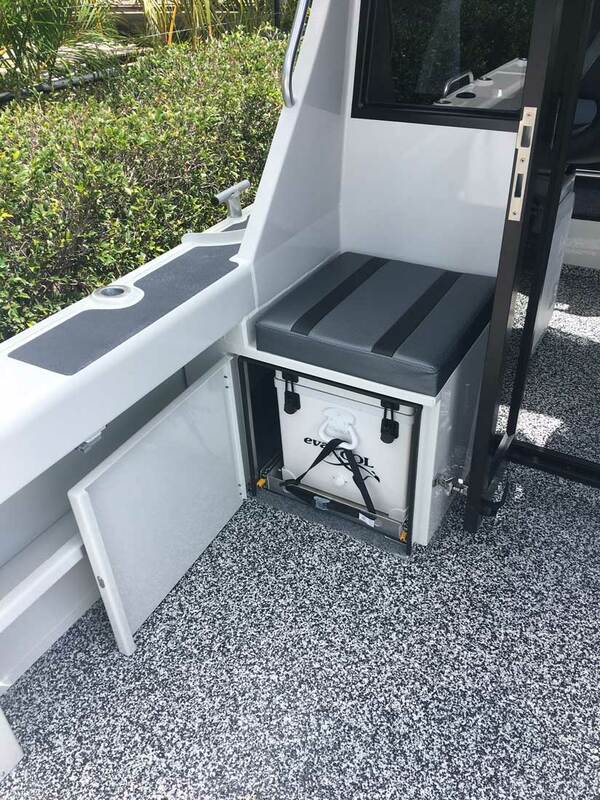 This configuration allows for extended overnight trips with individual sleeping arrangements that are 2m long which is a real winner.” remarks Darren Foster. 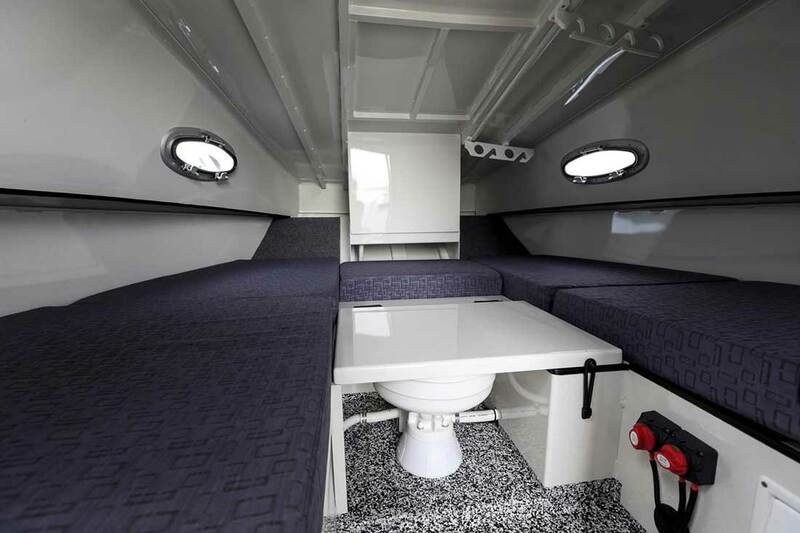 The forward berth also features a full flush toilet that does not need the bunks to be re-arranged to be accessed. The entry to this forward berth is made easier with a dash cut out and privacy curtain completes the setup. The mid cabin and helm area is bright and visibility is outstanding with glass windows maximising the full height between the cabin and the all-aluminium hardtop with standard windscreen wiper. Side opening windows allow for excellent ventilation. Designed for the enthusiast who spends long hours at the helm as seen a lot of thought go into the dash ergonomics and driver comfort. 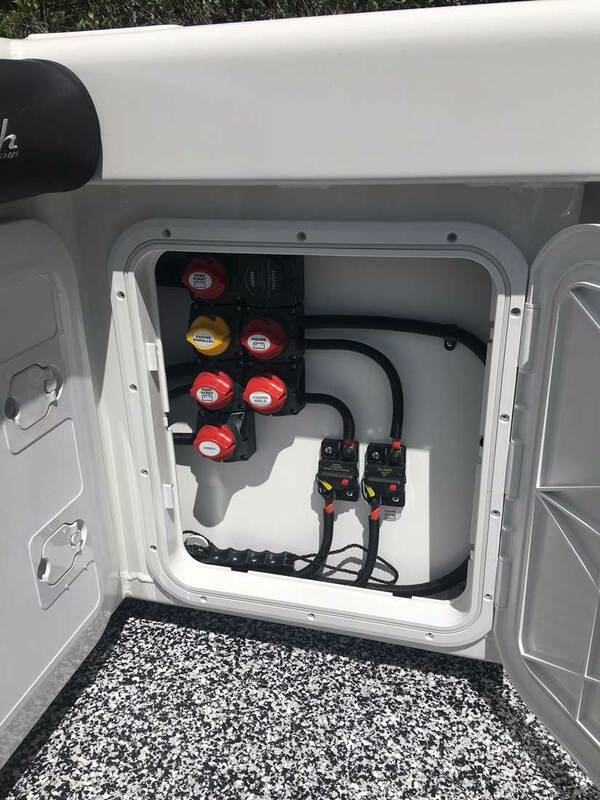 “Our customers regularly rack up 200 hours a year so driver comfort is a huge focus for us.” comments Darren. 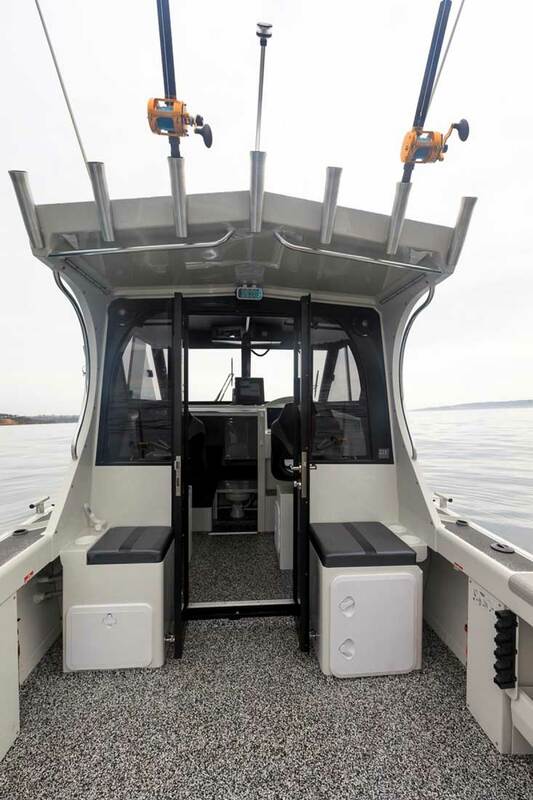 The expansive cockpit features innovative arrangements for a sink and stove, under gunwale lighting, gaff rack, LED work lights and a hybrid non-skid treatment to the floor – a great finishing touch. 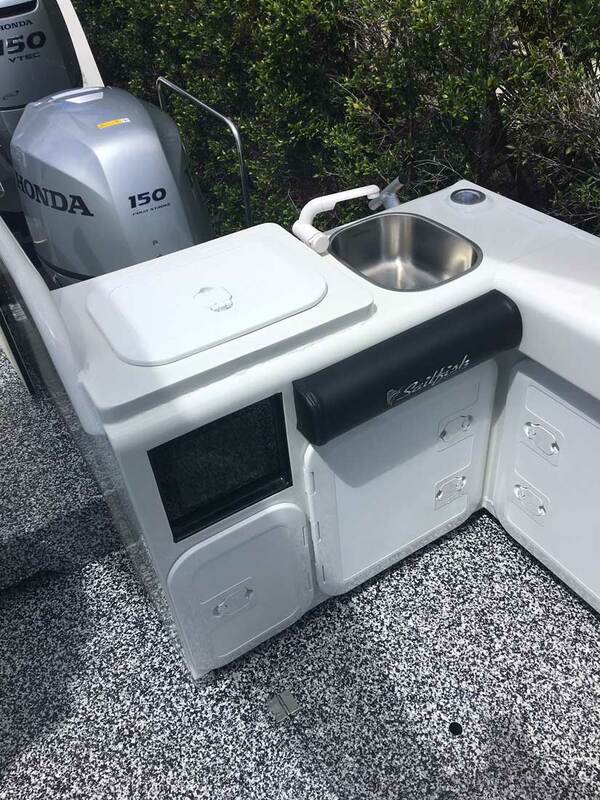 Fisherman are spoilt with underwater lighting, a welded cutting board with LED work light and salt tap, live well with viewing panel and internal LED to fully maximise night fishing and a high-pressure deck wash. 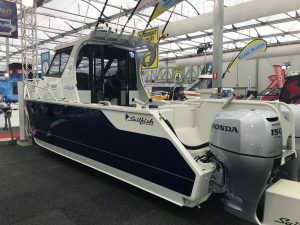 The functional walkout between the two Honda 135hp Four Stroke powerhouses is functional for fisherman allowing the ability to work a big fish all the way around the engines and ease of getting a fish on board. 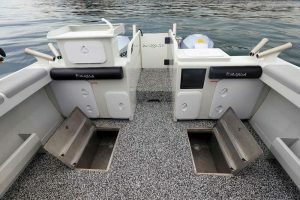 Divers and families will also love this unique boat access. 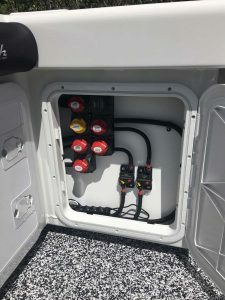 Our team will sit down with you and tailor an electronics package to suit your needs and budget. 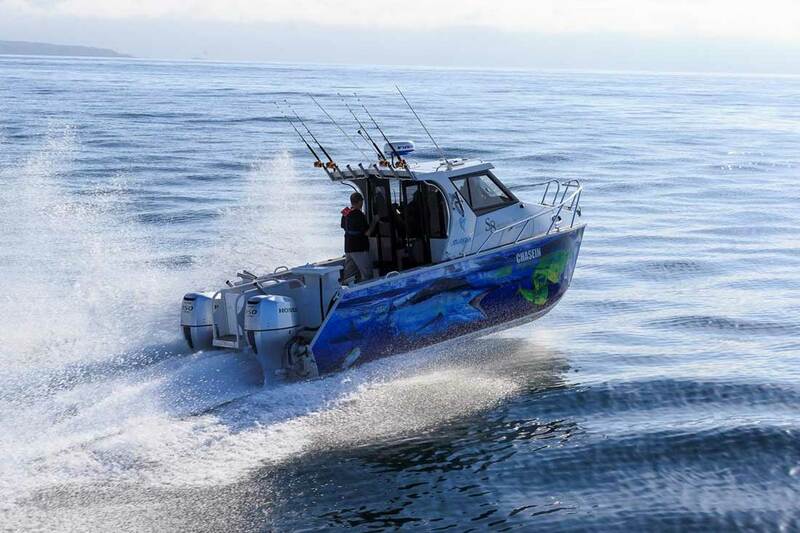 All new Sailfish S8’s sit on a custom matched Sailfish Aluminium trailer with torsion axles, LED lights and spare wheel. 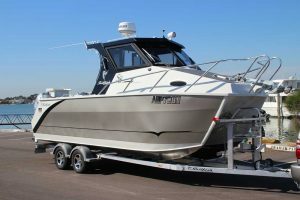 The trailer is perfectly set up for each boat ensuring that launching and retrieval is a breeze even in harsh conditions. 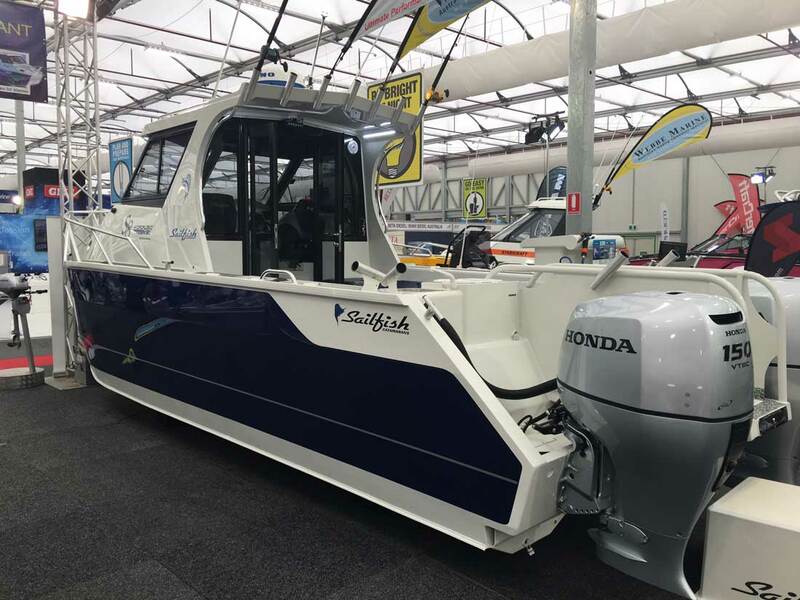 Sailfish Catamarans are all hand built right here in Australia and are regarded as the clear leader in aluminium catamarans both in Australia and internationally. With 22 years of proven market history supplying both the retail, commercial and government markets, Sailfish’s experience is your guarantee of excellence. 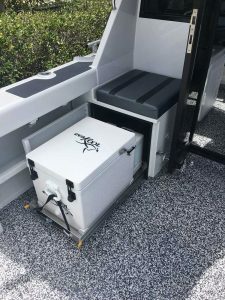 All Sailfish Catamarans are supplied as “Turn Key” packages with our packages offering an impressive level of standard inclusions that others call options. As with all Sailfish Catamarans our difference is our willingness and experience in customising those little items on the boat to meet your specific needs. 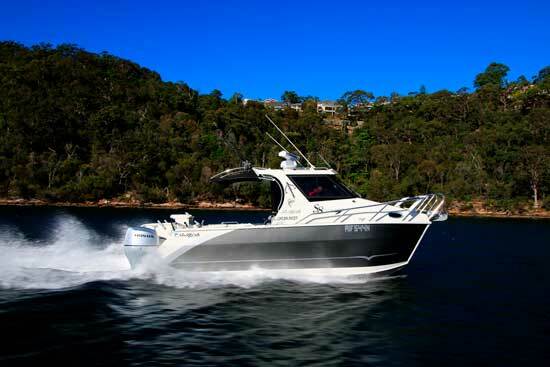 This ensures you have no redundancy in the application and get the most out of your new dream boat. As one of Australia’s longest running and most awarded marine business and a dealership where you deal directly with the owners – giving you access to over 45 years of combined marine experience. 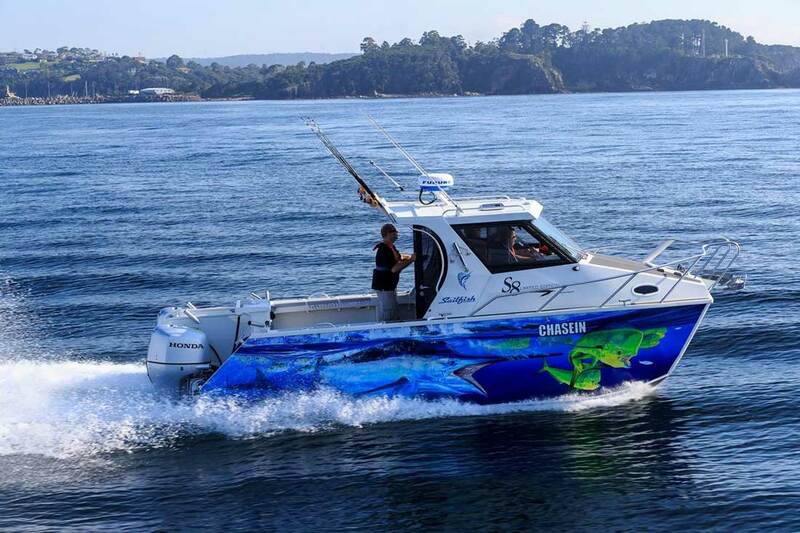 Call Ashley or Gavan today for more information on this boat or call us and set up a time to pop by that suits you. 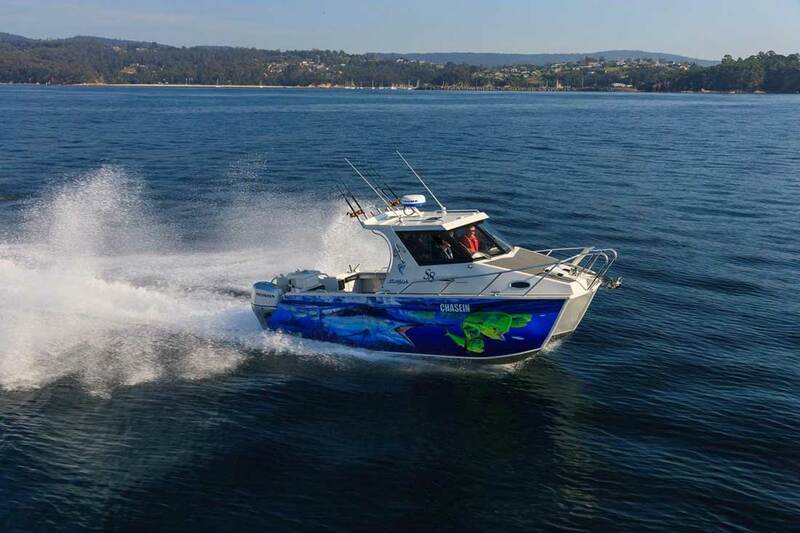 For our interstate customers, we are conveniently located only 30 mins from the airport in Sydney’s southern suburbs. We look forward to helping you with your new boat in the near future!